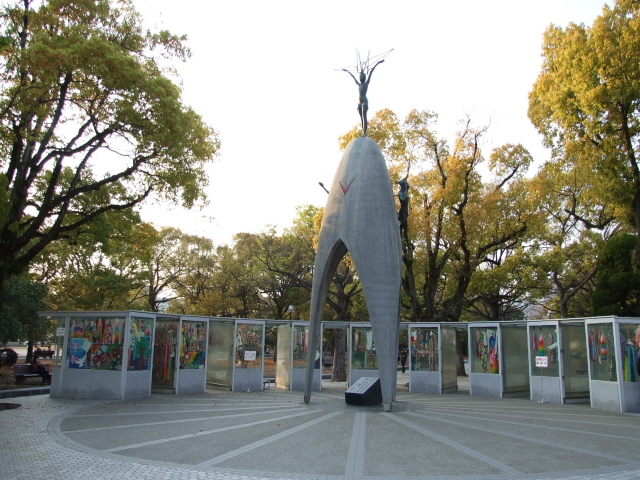 The central memorial space dedicated to commemorating the A-bombing of Hiroshima. The Peace Memorial Park contains the Peace Memorial Museum as well as various monuments. It takes up the whole area of the northern half of an island in the river, from the Peace Boulevard as its southern boundary all the way up to Aioi Bridge, which was the aiming target in the bombing. More background info: At the time of the bombing this area was a densely populated, busy part of the city of Hiroshima, but because nearly all the buildings here were wooden, nothing survived the atomic bombing, except for the concrete shell of the Fuel Hall, now the Rest House: Otherwise the whole area was completely flattened and scorched. After the war, as people started coming back and setting up shacks on the scorched wasteland, it was proposed early on to make this a memorial space. This now meant relocating the people who had set up shacks here. But all in all, the idea met little resistance, and as early as on the first anniversary of the bombing, peace memorial services were held here. In 1948 the "No More Hiroshimas" movement began and in 1949 a "Hiroshima Peace Memorial City Construction Law" was passed. 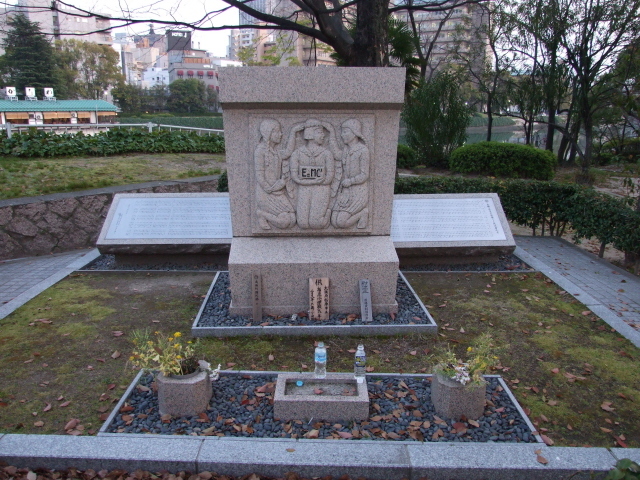 The Cenotaph for the A-Bomb victims was the first official monument to be completed. One by one more memorials, and the museum, were added. Today the Peace Park forms one huge complex of some 60 monuments/memorials, mostly on the island itself, but also on the eastern bank of the river all the way up to the A-Bomb Dome. The Gates of Peace: the newest addition, completed only in 2005 for the 60th anniversary of the A-bombing. This consists of a series of glass and steel "gates", each 30 feet (9m) high, 8.5 feet (2.6 m) wide and 5 feet (1.6 m) deep. On the glass the word for 'peace' is written in 49 languages – at night, when the monument is lit up, the writing comes out best. The monument is located on the grass strip of the Peace Boulevard on the other side of the road opposite the square in front of the museum and the Fountain of Prayer. East of the Gates, just before the river by Peace Bridge (and thus quite easily missed unless you come looking for it) is a small monument of the Hiroshima Municipal Girls' High School (676 of its pupils perished in the bombing). This wouldn't be any more remarkable than most of the other smaller-scale monuments if it weren't for the simple inscription "E = MC2", the famous "Einstein formula" to stand for the principles behind the atomic bomb. This little piece of theoretical physics contrasts sharply with the almost kitschy setting it is in here: on the granite relief stone the formula is held almost like a baby by one of three kneeling schoolgirls. It's an almost surreal sight. Back on the other side of the road directly opposite the Gates of Peace and facing the Fountain of Prayer stands the bronze Statue of Mother and Child in the Storm – a moving monument depicting a mother protecting an infant under her, leaning forward, while holding another child behind her back. It's supposed to represent the will to survive, and also to commemorate scenes that really took place at the time. 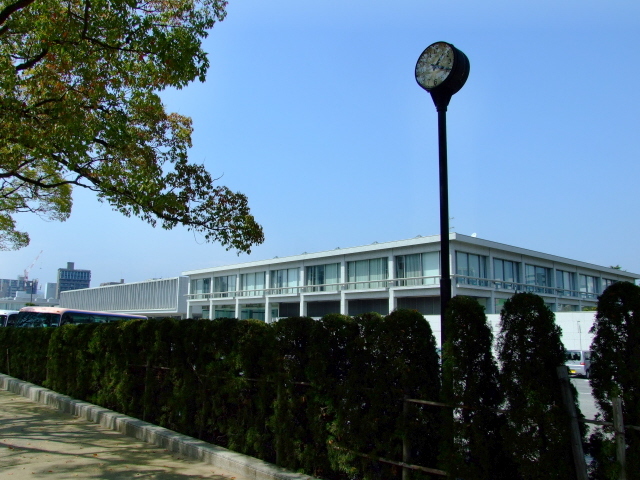 To the east, standing rather forlornly by the far corner of the museum's coach car park, is the Clock Commemorating the Repatriation of Those Who Chose to Return to the Democratic People's Republic of Korea – that's North Korea! It's really just an ordinary clock on a long thin pole, but the story behind it remains mysterious. While almost all other memorials in the park are given rather detailed descriptions of their significance, either on text plaques or in guidebooks, this clock is merely mentioned. No explanations whatsoever. 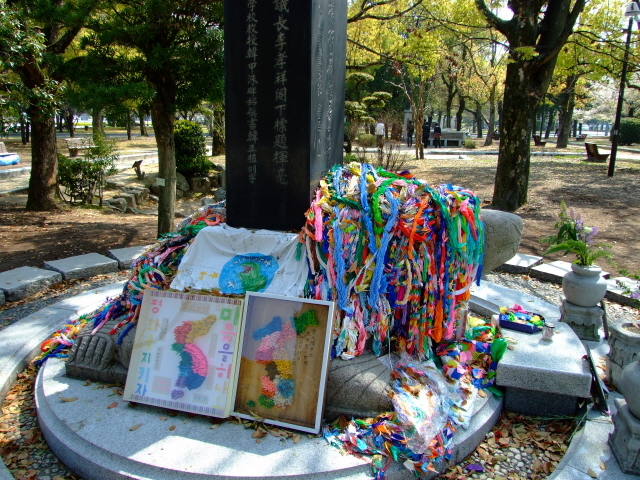 It can only be speculated that this is for political reasons – and that the background of the memorial must have to do with those Koreans who were forced labourers in Hiroshima and elsewhere. Many of these were exposed to the A-bombs of Hiroshima and Nagasaki, and those who survived the war were later given a choice to return home … apparently that included some who chose North Korea, presumably some time after the Korean War when the North was for a while the more prosperous half of the divided peninsula. On the other side of the museum's East Building some "Phoenix trees" can be found – these were replanted here from their original location further away from the hypocentre. The trees still show scorch marks from the A-bombing. Since they came back to life after the bombing they are regarded as symbols of survival and the city's resurrection. Roughly in the centre of the whole complex is the main Cenotaph for the A-Bomb Victims – the oldest part of the Park, although the present cenotaph is a reconstruction that replaced the deteriorated original in 1985. 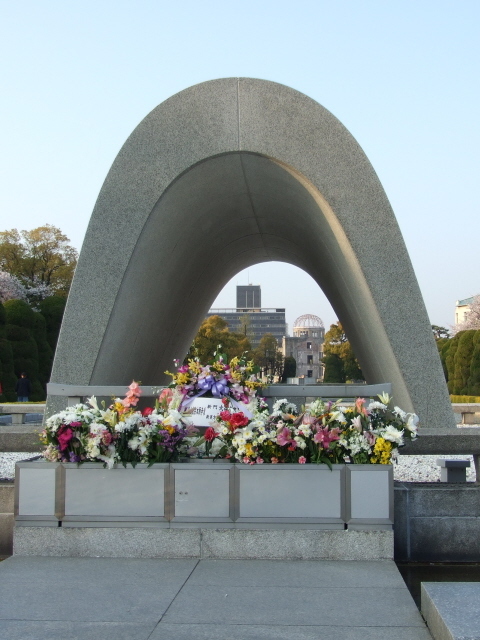 Below its main arch (through which you can see the A-Bomb Dome in the distance) is a stone chest that contains the register of the names of all those known to have died as a result of the bombing. Just beyond the Cenotaph, set inside the Pond of Peace is the Flame of Peace – it's to burn until the day when all nuclear weapons have disappeared from the Earth. It is to be feared that that means it's as good as an "eternal flame" ... at least as far as the "eternity" of the existence of "civilized" humankind is concerned. Just north of this is the Rest House, the former Fuel Hall (for distribution of fuel rations – originally it had been a kimono shop). It was the only reinforced concrete building in the area, and thus the only one whose burned out shell remained standing. Today it houses a tourist shop. But the cellar is still preserved in its state after the bombing. Across the road is one of the best-known monuments of the Peace Park: the Children's Peace Monument. 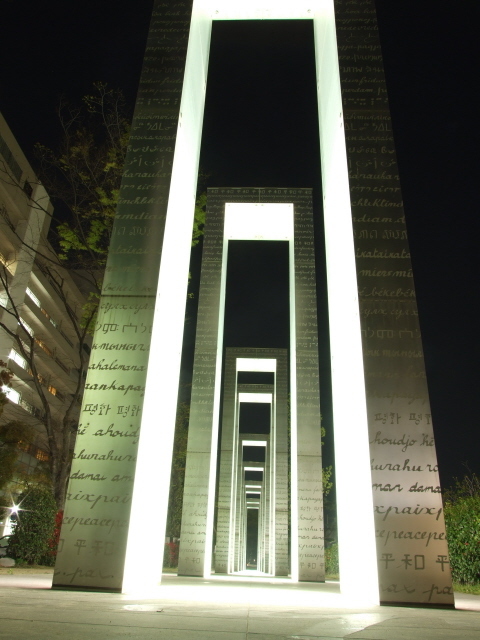 It's primarily a monument to commemorate the fate of Sadako Sasaki, a Junior High School girl who died of radiation-induced leukaemia 10 years after the bombing. She is also regarded as the initiator of those origami cranes becoming a special Hiroshima-related symbol of peace. Sadako is said to have made thousands of these cranes believed to be a symbol of good luck. 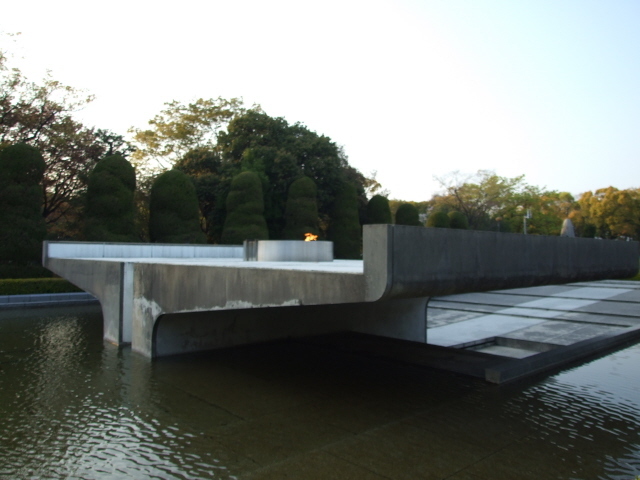 (See also the section in the Peace Memorial Museum dedicated to Sadako.) Today, it's customary esp. for schoolchildren to send or lay down strings of such origami cranes – in such large numbers that today they are housed in specially provided glass cases, complemented by a register in which donors can write their names. Further towards the western branch of the river there's a small A-bombed gravestone – i.e. 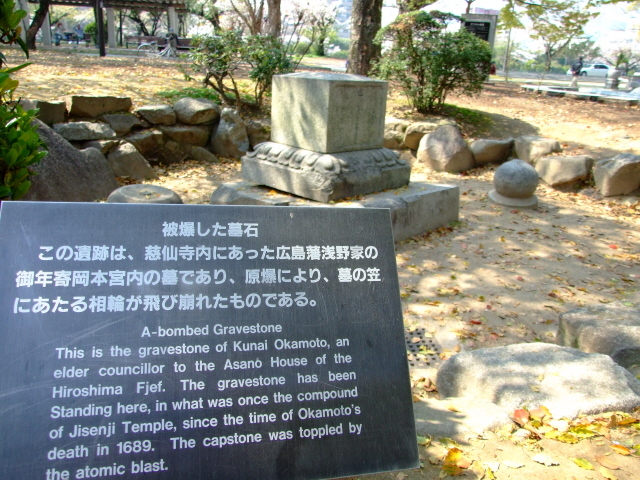 not a monument erected after the war but a gravestone subjected to the A-bomb blast itself – which blew its top half off – about 1000 feet (300m) from the hypocentre. It used to be part of the Jisenji temple and had been standing here since 1689. Just north of this is the Monument in Memory of the Korean Victims of the A-bomb. Unlike the mysterious DPRK-clock mentioned above, this monument is explained in great detail. 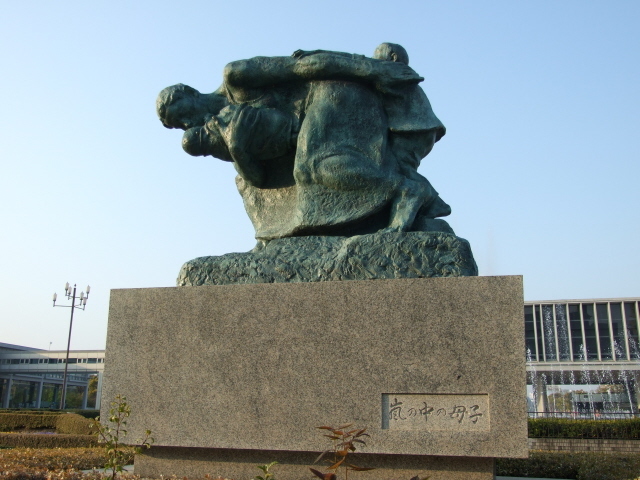 It's in memory of the 30-40,000 Koreans who were performing forced labour in Hiroshima when the bomb hit, many of whom perished in the blast. The monument was only moved to its present location inside the Peace Park in 1999, after a controversy about it having originally been placed outside the park, which was seen by some as constituting an act of discrimination. North of this monument comes a site that is amongst the darkest of the whole Park: the Atomic Bomb Memorial Mound. It contains the ashes of some 70,000 victims, most of them unidentified. 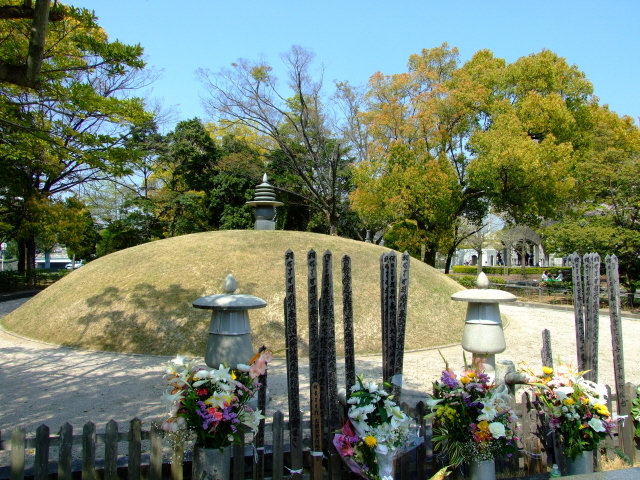 The mound itself is fenced off, but there's a small altar in front of it where you can stand and contemplate for a moment. Yet further north towards the bridge, another special element of the Peace Park is the Peace Bell, a tall Japanese bell weighing over a ton hanging inside a domed four-legged structure on a pedestal surrounded by a pond. Visitors are invited to step up to the bell and strike it using the wooden bell hammer supported from chains. And indeed it's a sound frequently heard when walking around the Park. A sign by the pond admonishes visitors not to strike the valuable bell too forcefully, though. Peace is a brittle thing, after all. Just before the Park narrows and ends at Aioi Bridge, there's the Peace Clock Tower. 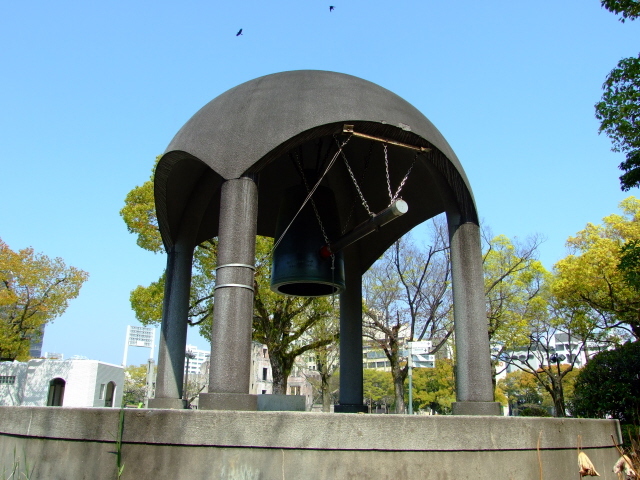 It chimes every morning at 8:15, the time of the A-bomb explosion on 6 August. 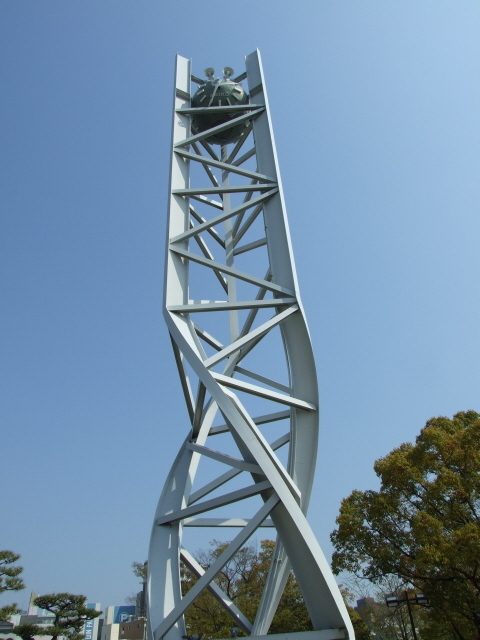 The clock sits atop a structure made of three iron pillars twisted by 60 degrees at about one third of the total 65 feet (20m) height – it's somewhat reminiscent of the twisted steel water towers on display at the Nagasaki Atomic Bomb Museum. Finally, there is the Aioi Bridge right at the top end of the Park. Its characteristic T-shape served as the aiming point for the Enola Gay's bombardier. He missed the spot by about 200 yards (180m) … not that it made much of a difference. The hypocentre, today marked by a simple stone monument, can be found in a quiet backstreet behind the A-Bomb Dome outside the Shima Clinic. Today's bridge is a widened new bridge that replaced the repaired original in 1983, though an effort was made to otherwise retain its characteristics. The Park contains numerous further monuments, typically ones dedicated to a particular profession or group of victims. The park as such is very pleasant, esp. at cherry-blossom time as a whole row of cherry trees lines the eastern riverbank, which is accordingly very popular with locals who hold cherry-blossom parties here. It's a kind of weird sight at this otherwise so sombre place, but on the other hand a welcome sight of normality having taken over despite the grim history and significance of the site. 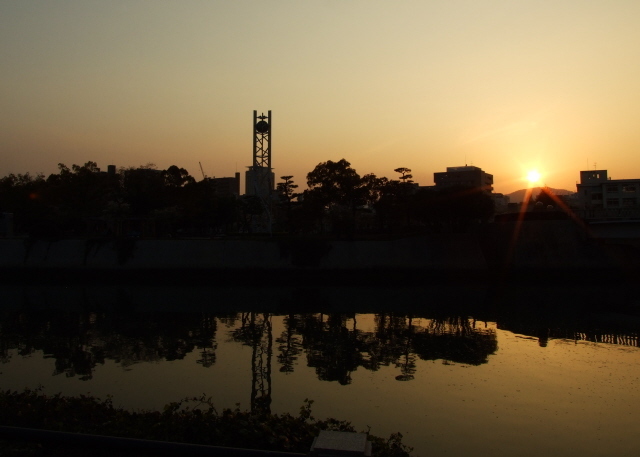 Location: right in the centre of Hiroshima, just west of its main shopping district around Hondori; on the northern part of an island between the Motosayugawa and Honkawa branches of the Ota river delta. Details: from Hiroshima station it's a ca. 20-40 minutes' walk (depending on which route you take), first south past the huge department store, across the river, then either turn right at Inari machi and walk all the way down Aioi-dori. Or continue further south and then walk up the Peace Boulevard to take you to the southern end of the Park (longer and maybe a bit beyond easy walking distance – given how much walking is involved at the Park and its museum itself). You can also take a tram, either one bound for Eba or Miyajima-guchi and get off at Genbaku-Domu mae just outside the A-Bomb Dome at the northern end of the Park, or get a tram bound for Ujina (Hiroshima Port) and get off at Chuden mae near the Peace Boulevard that leads west past the south end of the Peace Park, closer to the Peace Memorial Museum. There are also buses (red line) going from Hiroshima Station (bound for Yoshijima) right to the Peace Gates outside the Peace Park's southern end. The Peace Park is mostly openly accessible at all times, except of course for the Peace Memorial Museum and the Memorial Hall (see under what there is to see). Most of the Park is wheelchair accessible, except for where there are steps e.g. down to the riverbank, or up to the Peace Bell (only a few steps); parts of the grounds on the western side are non-paved but still fairly flat. Time required: depends on how many of the monuments you want to see, and how much time you want to spend just strolling around; but ca. a couple of hours should sensibly be set aside for a leisurely exploration of the Park. 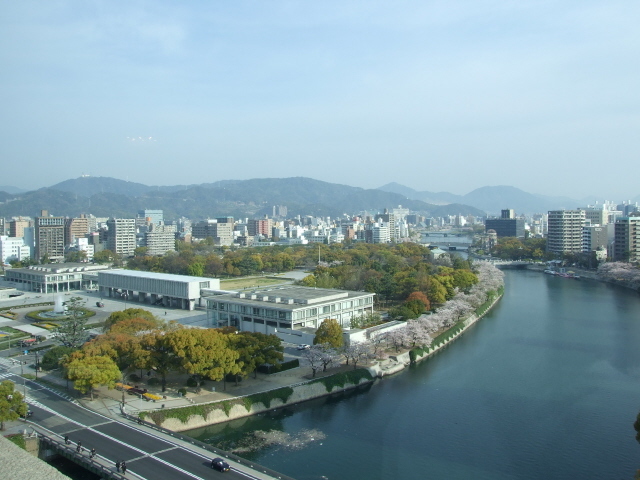 Combinations with other dark destinations: in general see Hiroshima; and the separate entry for the Peace Memorial Museum, the Park's central and most important site – the closest and most obvious other sight outside the Park (though often described as part of the Park itself) is the iconic landmark of the A-bomb Dome just to the east of the Park's northern end at Aioi Bridge. Crossing the Aioi Bridge to the west will take you to the Honkawa Elementary School Peace Museum.